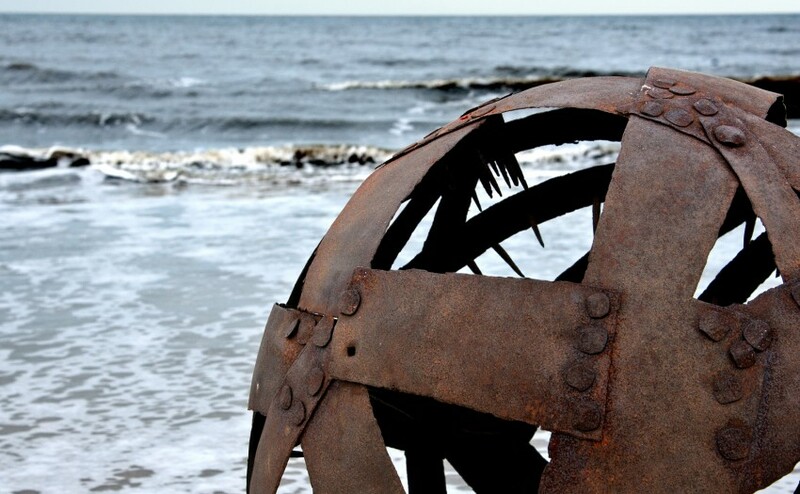 A hollow sphere encircled by thin, uneven, rusty metal bands held together by hand-wrought nails. The nails push down randomly into the empty centre. Here Wolf has used old metalworking techniques for reinforcing a wooden object. He made the nails himself, heating each one to a glowing red in an open brazier and forming it with hammer and anvil. He hammered the metal bands around a large wooden sphere, over the grain and the splits and the knot-holes on its surface, and then secured them with the nails – the same technique that was used to make a wooden ship seaworthy. He then allowed it to be fully exposed to the weather, leading in the end to its complete decomposition. All that was left was the metal shape pierced through by the nails. 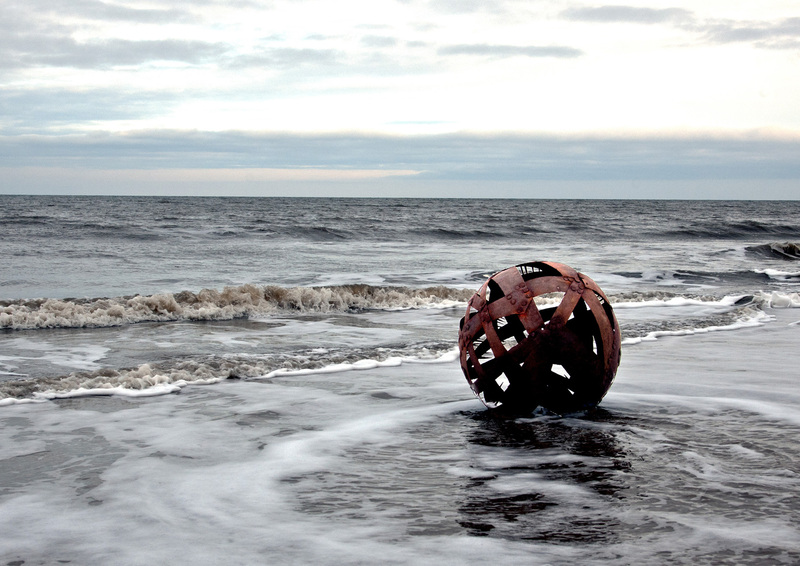 Flotsam has been part of Wolf’s early work and his preoccupation with the theme of the ‘Missing Piece’. What is missing here is the wood that had made it possible for the sphere to float. 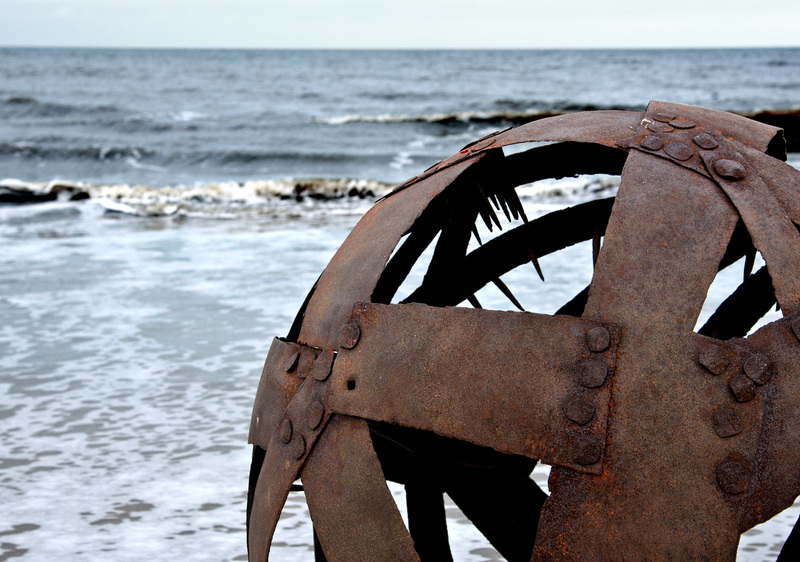 The sculpture evokes the image of a shipwreck – a decayed and derelict hulk with its now useless metal parts. 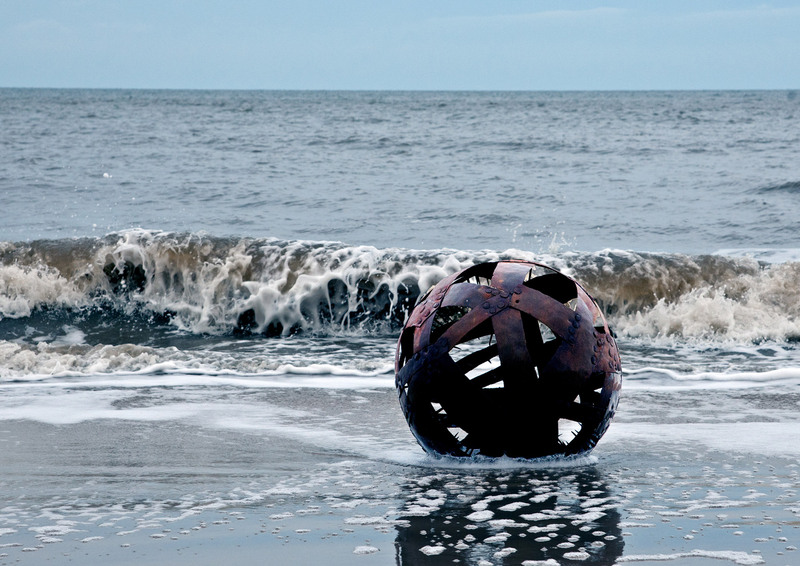 If you do not know its story, then flotsam remains a mystery. An old hulk, some metal pieces … from what? 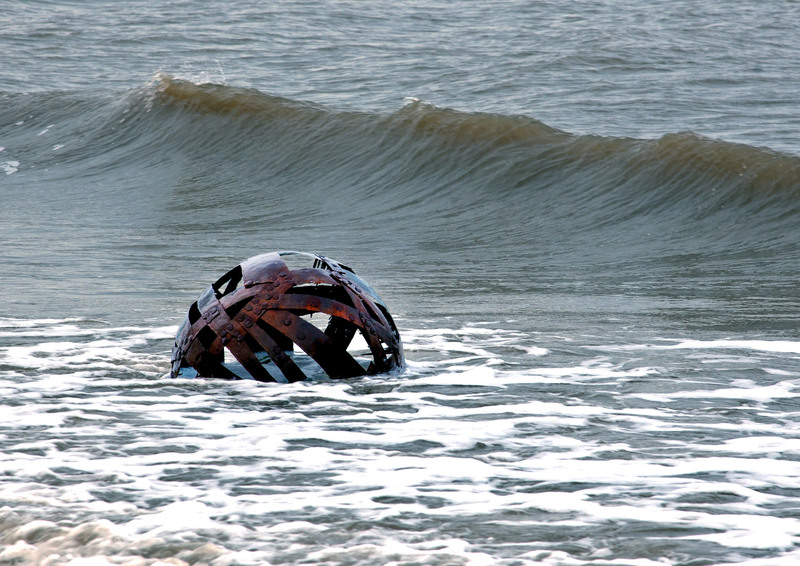 The mystery itself provides the clue: how can a thing be flotsam if it cannot float? Closer inspection leads the onlooker to think of a chain of events. 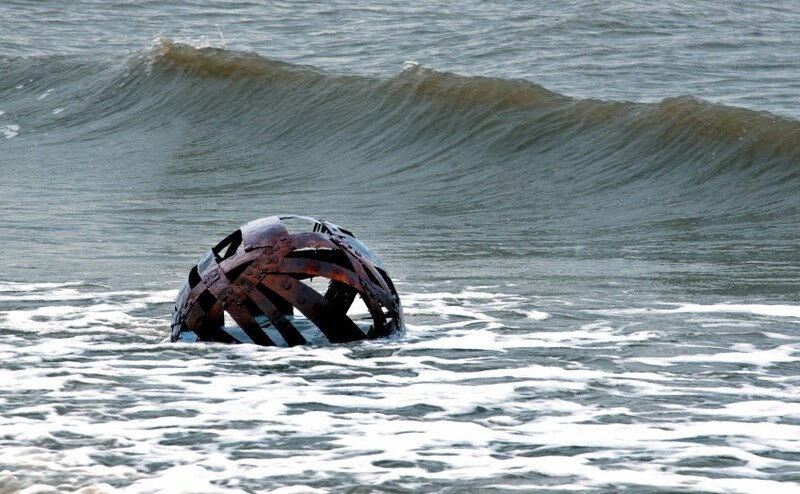 The flotsam must have been a wooden sphere, so now the reason for the shape of the metal bands becomes clear. So too does the reason for the nails, which would otherwise have served no purpose. And if the centre was made of wood then it would also have been able to float, though that must have been long ago. The wood – the ‘Missing Piece’ – has gone, lost to the ravages of time. 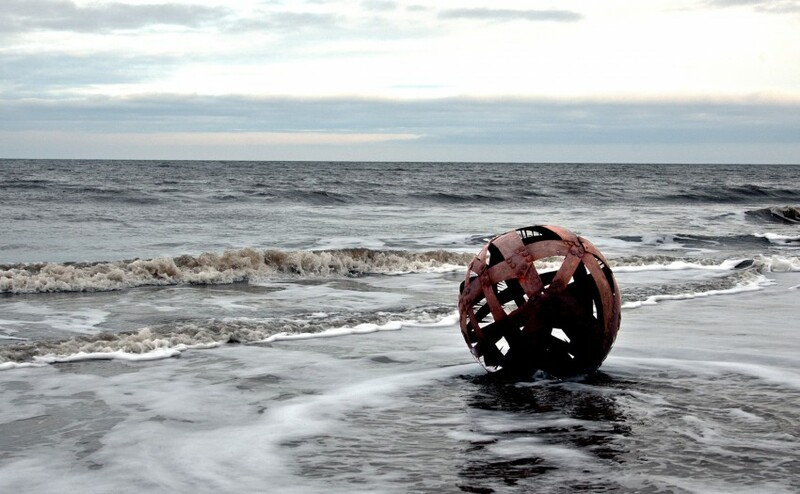 One day the sphere was washed in by the sea. 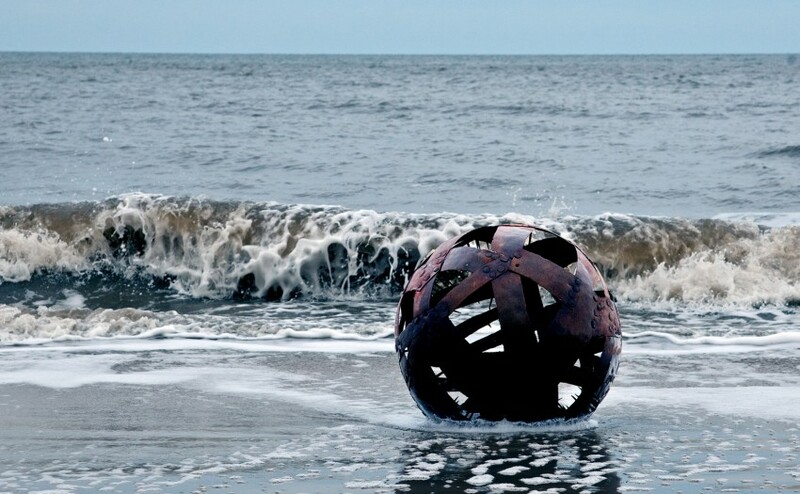 It will never leave the shore again.